Most dogs are taken on walks on collars. In the past, bulldogs got the same treatment. 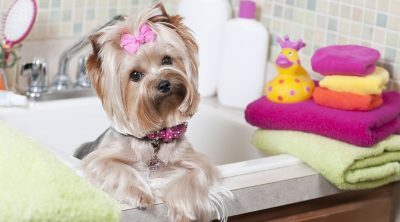 But the vast majority of modern owners insist on using a harness over a collar. The reason is simple: the unique shape of bulldogs. 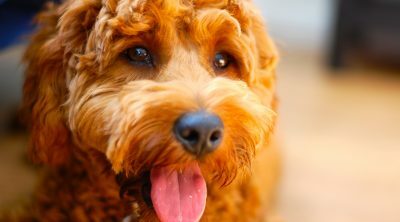 This breed is well-known for its dense and muscular physique. More importantly, English bulldogs have thick and short necks. Unlike German Shepherds or golden Retrievers, a bulldog can easily slip out of a collar than a harness. A harness can prevent a bulldog from pulling and maneuvering itself out of a killer. The harness supports a dog’s upper body area. The pressure is never solely on the neck. Keep in mind that a harness doesn’t completely prevent your dog from pulling. It allows the holder more control, even if a dog struggles to get out of a harness. Harnesses are not without problems. One of the biggest complaints is that it causes dragging and maybe some underfoot. However, most these problems are overshadowed by the benefits harnesses offer to bulldog owners. There are several factors to consider when choosing a harness for your bulldog. The most important factor, of course, is the size. Harnesses are usually made for larger breed dogs like Labradors. So these can be a really bad fit for small but strong dogs like bulldogs. Unless, that is, if you choose the right size. Before you pick a harness, measure your dog. Bulldogs tend to be 23 and 26 inches around the girth on average. Bulldogs can weigh between 40 to 60 pounds. Individual dog sizes matter, which is why you need to measure the dog carefully and properly. Finally, the harness should fit snugly, but with some flexibility allowed in there. It should not restrict the normal movement of the dog. The harness attaches to a leash. If this attachment point is in the front, it should be positioned in a mid to high point on the chest. This prevents the leash from dragging underfoot. You should prioritize the comfort of the dog as well as the security. The idea is to keep the dog in the harness. Some dogs will try to get out no matter what if the harness is uncomfortable in any way. This type of harness allows the leas to be attached to the pet’s back area. This allows the pet owner direct access to the harness. The leash will not get around the dogs chest either. Back-clip harnesses are secure and convenient, but might not be the best choice for dogs that pull a lot. The harnesses might de-attach or hurt the dog with serious pulling when the leash is on the back. 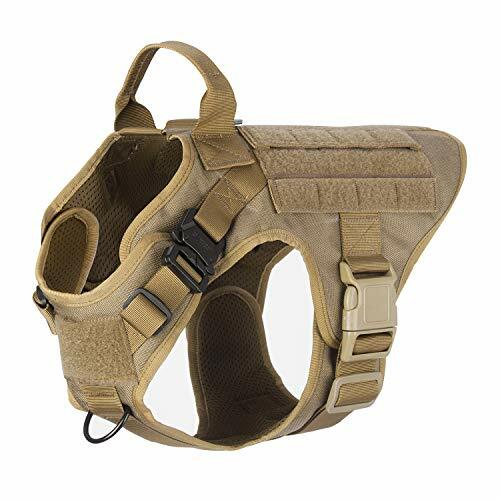 Front-clip harness allows the leas to be attached to some point on the dog’s chest. 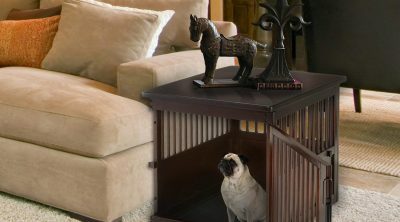 This is great for pullers because the pet owner has more control in reigning in their bulldogs. When a bulldog pulls on a front-clip harness, the pressure is in the opposite direction. So the dog can’t take off as with a back-clip one. As bulldogs have shorter profiles than most other dogs, a front-clip harness could drag or cause tripping. It could cause tangling as well. You would also need to find a front-clip leash with a high enough attachment point. Both types of harness have pros and cons. You should weigh in both and decide which is better for your pet. This is a solid harness to consider if you have hard pulling bulldogs. It’s designed for super active dogs who love to give their owners hell pulling on walks. The label says the harness is also suited for elderly dogs. The main advantage this harness offers is that it’s made not to choke dogs that pull really hard. 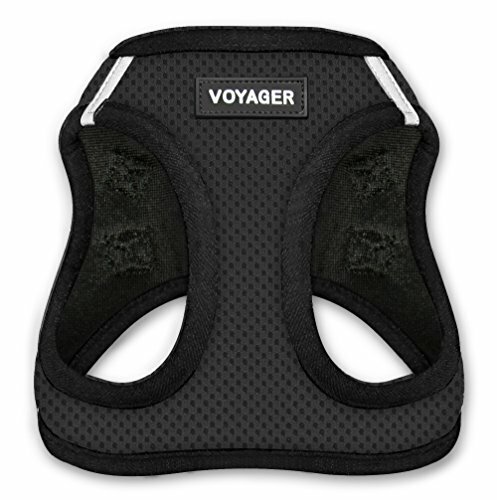 The harness has an extra pad, a D-ring, and an extra handle to give owners more leverage. To prevent the dog from slipping out of the harness, there are attachments called D-rings. The D-ring is attached to the center ring of the harness to give the bulldog freedom. There’s an extra handle on the harness too. For bulldogs that really don’t want to listen, the owners can prevent pulling by quickly grabbing the handle. So it’s a win-win situation here for dogs and their owners. The bulldogs can walk as they like, while owners have more control over pulling. What’s more, the harness is easy to put on stocky bodies. There are no complicated extra straps and snaps. Just pull it over and adjust using the buckles. This harness is sturdily built. The polyester material can withstand rough handling. The material is perfectly machine washable. But do not tumble dry and line dry instead. Everything is great except for the snug fit. The harness gives a good fit, but can slip and move if the measurements aren’t quite right. Because the harness doesn’t come in custom sizes, not all bulldogs would experience a snug fit with this. The Rabbitgoo dog harness comes in sizes varying from small to extra large to suit different types of dogs. The small to medium sizes might fit your bulldog who loves to pull. In fact, the harness comes with a “no pull’ label. 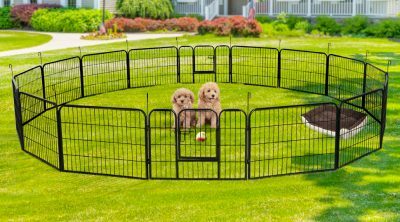 It won’t prevent your dog from pulling, but it’s designed to make it easier for the owner the control the dog. This harness has not one but two leash clips. One clip attaches in the front—great for pullers—and another on the back, for dogs with milder sentiment. The attachment points are metal. Some bulldog owners may hesitate considering the harness is for all dog types. But there’s a feature on this harness that mitigates this problem: adjustable straps. The Velcro side straps are there to make it easy for the owner to snugly fit this harness onto their pooch. These straps are reflective too, meaning it makes night-time walks safer. The harness is made mainly from synthetic material. The straps are padded, but are made from breathable material, according to the label. The padding prevents chafing and similar discomforts. 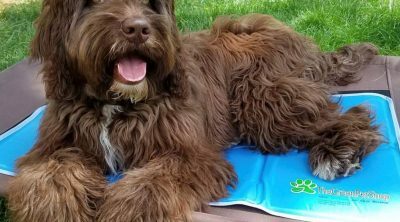 The breathability of the fabric makes it easy for your dog to wear this on long walks on hot days. This harness could be a good fit for bulldogs as long as the owner gets the measurements right. But keep in mind, as convenient as this is, it’s not machine washable. You would have to keep it clean with manual washing. This is an interesting harness designed for dogs with chest girth varying from 13 to 42 inches. There are different sizes to choose from to suit your dog. The medium or large sizes should fit a bulldog. 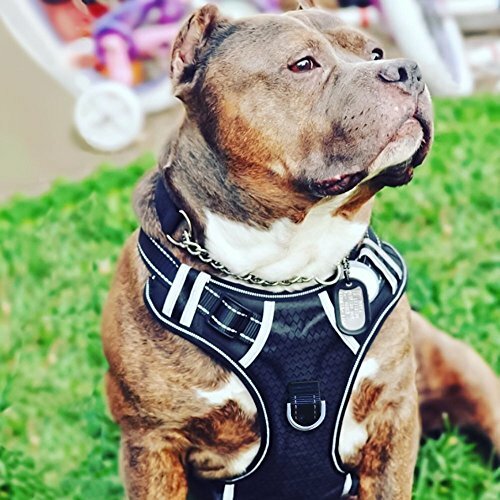 The brand says this harness comes with adjustable straps, which are so flexible it can give your dog a “custom” fit. 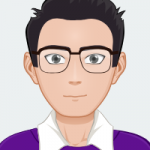 As the size is so important, this might be a factor worth looking into. 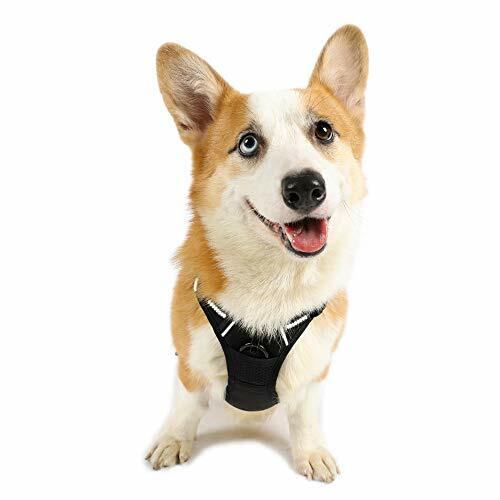 The harness is well designed in synthetic fabric. Unlike most bulldog harnesses, this is not padded. It’s extremely lightweight as a result. Padded harnesses could be uncomfortable to wear for some dogs. Most bulldogs might not really feel wearing this harness around because it’s so lightweight. This harness, too, offers a no-pull design. The label says any pulling pressure is evenly distributed throughout the harness so there’s no risk of chocking. The brand even offers a 100 percent satisfaction guarantee to this effect. The harness does offer a simple design that makes it easy to put on. There are quick snap buckles to lock the harness in place quickly. Plus, the straps are highly reflexive for night time walks and jogs. The material used here is synthetic nylon oxford fabric. It’s fairly soft and is machine washable. In addition to the front clip, the harness has a D-ring no-pull clip to drag your bulldog away from confrontational situations. The price is quite affordable as well. The only thing is, without the padding, some owners may have to worry about some minor chafing. The brand offers several sizes and warns that it doesn’t correspond with breed specifics. You need to measure you dog at home and choose the right size. Bulldogs may need the extra large size, which is made for chest sizes between 21 to 23 inches. This is a completely synthetic dog harness made from breathable mesh material. The fabric isn’t absorbent, and wicks off any liquid that gets on it. As a result, this harness is somewhat weatherproof. It won’t absorb moisture during rain and become heavy. The lack of absorbency makes it easy to keep the harness clean. 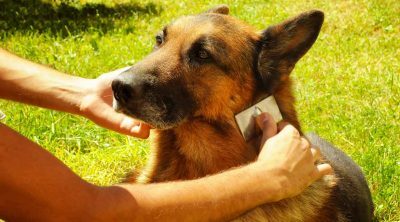 However, it will also keep sweat and heat on your dog’s skin during summer daytime walks. Also, this harness comes in a whole bunch of colors to choose from that fashionable pet owners would love. The price tag is one of the cheapest on the market as well. Some bulldogs can be really strong willed. Owners of stubborn bulldogs on the lookout for super sturdy harnesses might want to consider this “tactical” option. It seems designed for working dogs, as in for K9 officers or guide dogs. This harness offers a number of sizing options. The label promises a “custom” fit. The harness is interestingly designed, according to the label. It’s made with placing two harness components together, so there are four adjustable positions. In other words, you can get a better fit with this than most others available in the market. The harness is secured with a number of metal buckles made with alloy. There are buckles on shoulders and sides to ensure a snug and secure fit. It’s not easy to put on, but in return you will get the best fit imaginable across the shoulders and the chest. There’s a no-pull front clip the leash attaches to prevent the dog from running off. It’s designed for training dogs. There’s also a separate bad leash clips for better trained dogs. In addition, there’s a handle that’s sewn in as well. This harness looks superior is design and fit compared to just about any other listed here. However, better quality comes with a higher price. One of the biggest problems with slight, synthetic dog harnesses is chafing. Lightweight harnesses are easy to where, but as the bulldog moves, and ultimately pulls, the risk of chafing is high. The Embark padded dog harness might just be the product you are looking for if chafing is a concern. The medium size is recommended for bulldogs, though you would need to check in with the exact size chart. The fabric harness is designed with control in mind, as there’s a handle in the back for more owner control. The military-grade nylon used is synthetic and lightweight, so even with the padding, it most likely won’t feel too heavy. This harness is designed with everyday use in mind, such as for walks in the park or occasional hikes. The label says this harness is suitable for rescue, therapy, and service dogs too. The harness is compatible with seatbelt attachments. It has a front leas attachment, which is made from a reinforced material. It’s easy to put on and the sizing is not off the charts. It’s well worth giving a try. It’s quite a tough call between all the harnesses reviewed above. They all offer similar features that bulldog owners often desire. 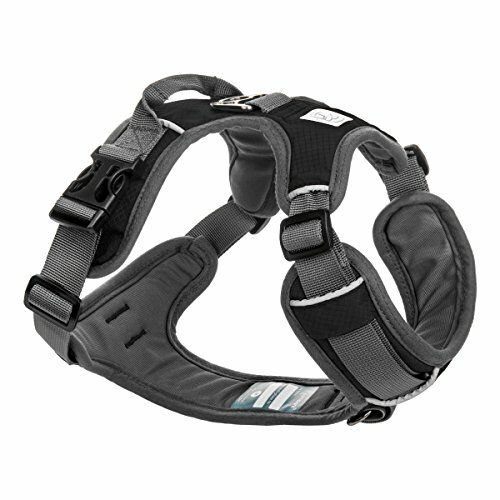 However, the top pick would have to be the HDP Big Dog Soft No Pull Harness. Mainly because it’s the closest you will get to a bulldog-specific harness in a market saturated with generic product. 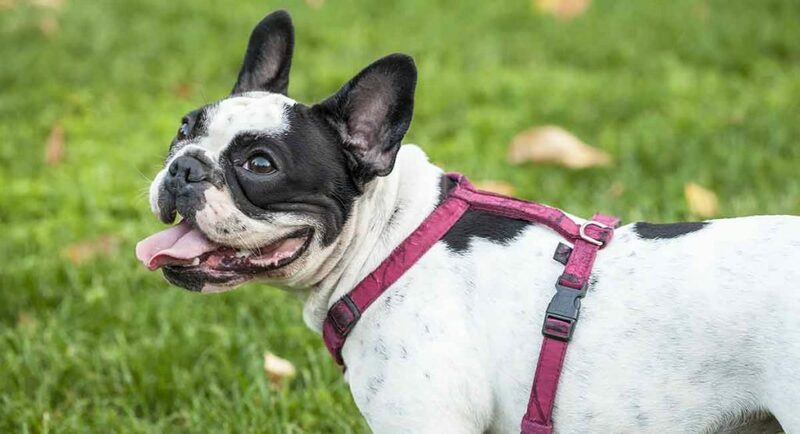 This harness is designed with stocky dogs who love to pull. It’s well-padded with handles and D-rings to allow the owner excellent leverage. But the leverage doesn’t come at the cost of comfort for the dog. The pricing is highly reasonable considering all the features offered as well. You can expect durability and a snug fit with the HDP harness. But this is only a suggestion. 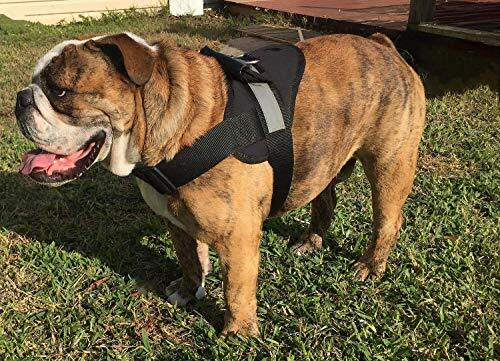 You can browse the other reviews to see if there’s a better fit harness for your bulldog.